The Federal College of Education, Okene, Kogi State invites applications from: External Auditor/Audit Firm. Interested candidates/firms should possess relevant qualifications. - Click to read more..
A medium 3 Star Hotel in a strategic location at Lokoja, Kogi State is recruiting to fill the position of: Accounts Officer. Interested candidates should possess HND/Degree/OND in Accounting or Business Administration with at least 2 years work experience. - Click to read more..
A medium 3 Star Hotel in a strategic location at Lokoja, Kogi State is recruiting to fill the position of: Sales Executive. Interested candidates should possess HND/ University Degree/ OND or its equivalent in any related discipline. - Click to read more..
A medium 3 Star Hotel in a strategic location at Lokoja, Kogi State is recruiting to fill the position of: Hotel Operations Manager. 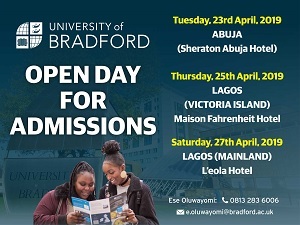 Interested candidates should possess HND/University Degree in Hospitality Management or related disciplines with at least 3 years work experience. - Click to read more.. Participation Initiaitive for Behavioural Change in Development (PIBCID) is recruiting to fill the position of: Finance Officer - Local Rights Programme. The position is located in Kogi State. Interested candidates should possess BA/B.Sc/HND qualification with at least 3 years work experience. - Click to read more..
Daily Need Distributors Limited is recruiting to fill the position of: Van Sales Representative. The position is located in Lugbe-Abuja and Lokoja-Kogi State. Salary: N50,000 monthly. Interested candidates should possess minimum of an OND qualification with 2-3 years work experience. - Click to read more..
Silver Valley International College is recruiting to fill the position of: School Vice Principal (Academics). The position is located in Kogi State. Interested candidates should possess a Bachelor's Degree in Education or Bachelor's degree in any relevant field and PGDE with at least 10 years work experience. - Click to read more..
Smart Partners Consulting - Our client, a Social Enterprise is recruiting to fill the position of: Sales Merchandiser. The position is located in Rivers, Kano, Kogi, Nassarawa, Plateau, Kwara, Ondo and Kaduna States. Interested candidates must be a Post-NYSC graduate of any tertiary institution in any field. - Click to read more..
Tyonex Nigeria Limited is recruiting to fill the position of: Medical Sales Representative. The position is located in Kaduna, Kano, Kwara, Kogi, and Benue States. Interested candidates should possess relevant qualification. - Click to read more..
Society for Family Health (SFH) invites applications for its Young Talent Programme (YTP) - Sales - Marketing, Pharmacy. The position is located in North Central, Nigeria. We seek people who are self-motivated, achievement oriented, innovative and who are able to think 'outside-the-box' to cope with the ever-changing business environment. Candidates should possess qualifications in Pharmacy, Marketing, or other related fields of study - Click to read more..